Hortense Casady Oldfather(Tensie) was born on May 7, 1919 in Los Angeles, California, and died October 2, 2007 in Kansas City, Missouri, surrounded by family members. Soon after her birth parents Simon Casady and Margaret Wheeler Casady returned to Des Moines, Iowa, where Mom lived until she attended the University of Nebraska. After her graduation she married Charles Henry Oldfather in 1942 as he went off to World War II.After the war Dad attended Harvard University Law School and Mom tended her growing family. He then practiced law enough to decide he wanted to teach and they found a home in Lawrence and the KU community in 1950.Mom had a strong sense of responsibility to her community. While raising us she found time to volunteer with 4-H, the Red Cross Blood Bank, the League of Women Voters and Head Start. Later were the Bert Nash Center, United Wheels, Volunteer Clearing House, Children’s Hour, Volunteers in Court, the Villages and others.To her surprise, inheritance brought her more money than she needed, especially with her modest style of life. Gradually she and Dad started making donations, large and small, to a variety of organizations, especially Kansas University. After Dad’s death in 1996, Mom continued her volunteer work and philanthropy. 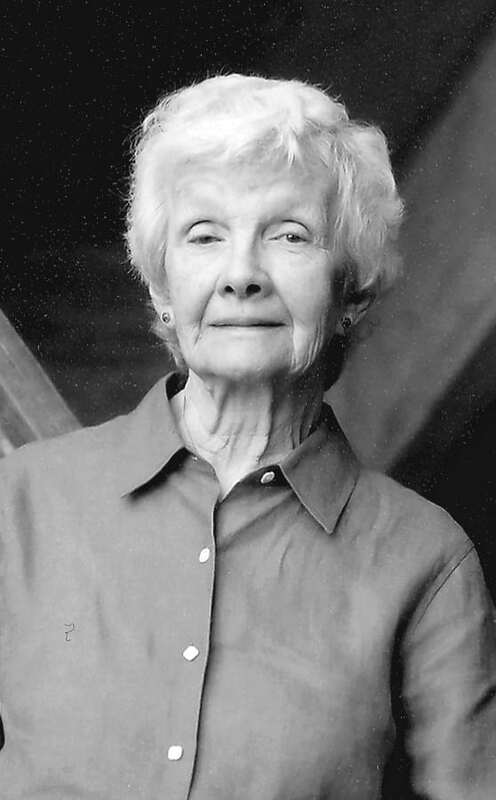 Major beneficiaries included Topeka Civic Theater, KANU, Reading Services for the Blind, Lawrence Memorial Hospital, the American Friends Service Committee and the ACLU.The Douglas County Community Foundation may be her most lasting legacy. In 2000 she provided the seed money to start the Foundation. Others have been inspired to join her, and the Foundation is having a growing impact on the community through its grants and its leadership.Our mother was a person who helped many, many people over the years, sometimes with her friendship, sometimes with money. To her family she was a wonderful mother and friend. We will miss her. Tensie is survived by her children: Felicia and partner David Bitts, Timothy and wife Susan Wackerbarth, Stephen and partner Joyce Louden, Melanie, Christopher and wife Fredrica Wyman, Jon and wife Holly Ford, William and wife Dyann Myers. Tensie has seventeen grandchildren and five great-grandchildren. She is also survived by close friends Marnie Argersinger, Sally Davis, Retta Backus, Web Golden, Theresa Lee, Sara McCay, David and Susan Milstein, and Judy and Jack Wright. In lieu of flowers, please make a donation to the Douglas County Community Foundation or to the charity of your choice.There will be a celebration of Tensie Oldfather’s life at 7:30 pm on Wednesday, October 10, at Liberty Hall in Lawrence.See the special family tribute.